After two weeks island hopping in very westernised islands filled with western people, it has been really nice to return to cities where I can witness Thai people just going about their daily lives, doing everyday things. 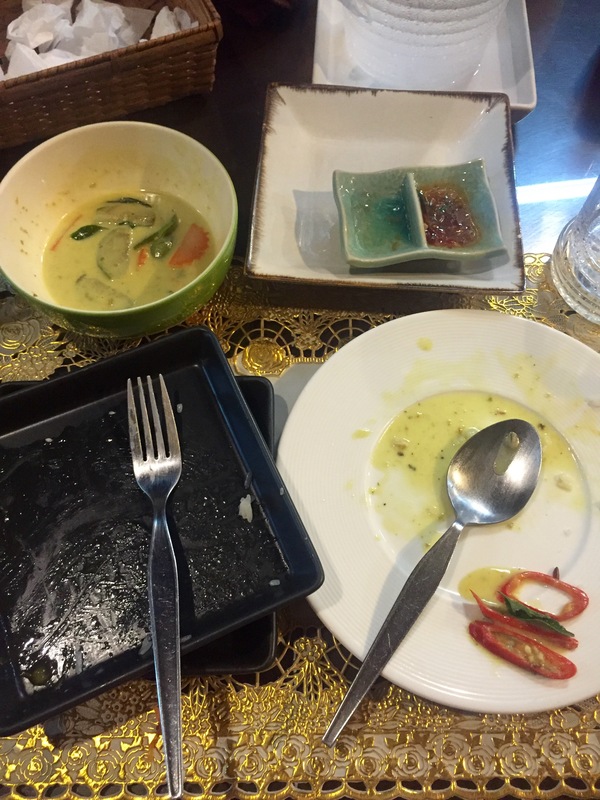 I really feel like Ammun and I have got the true taste of Thailand in Chiang Mai and it has been all the things that I stereotypically imagined from Thailand before coming. 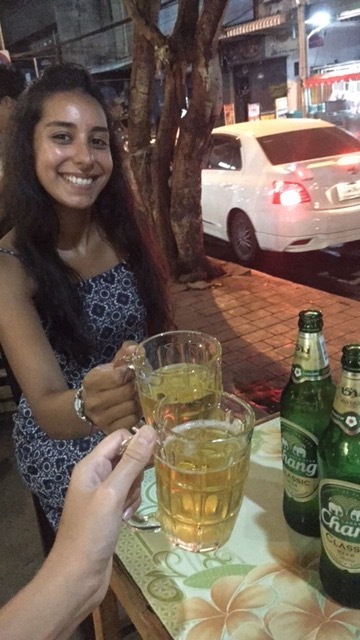 From the airport we go a taxi across Thailand’s second biggest city to Glur Hostel. 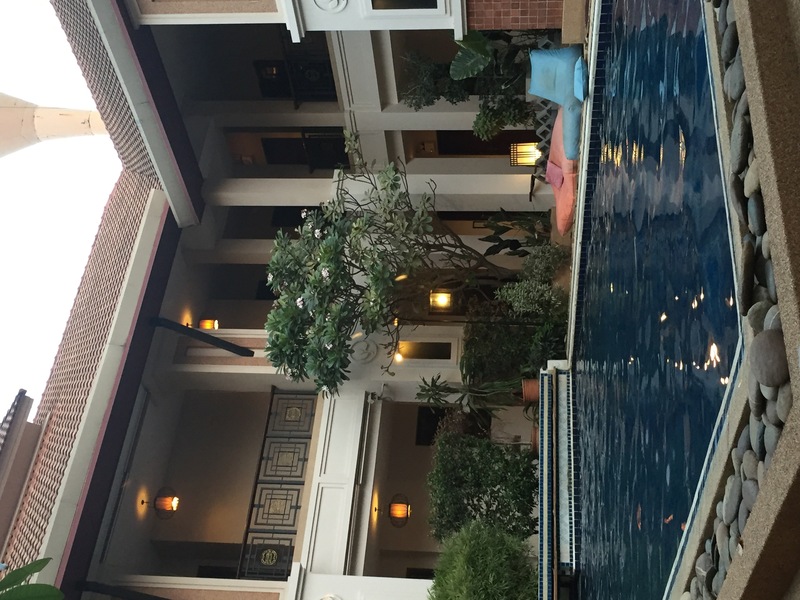 It was described online as a ’boutique backpackers hostel’ and that’s exactly what it was; a pretty hostel with comfortable beds and a decent sized pool but most of the guests were young backpackers. The best part was when we arrived and were told that our dorm room booking had been upgraded for free to a twin room! This meant free hot drinks, a fridge, an ensuite, 3/4 sized beds and a hair dryer. We could finally do something about our frizzy hair!! 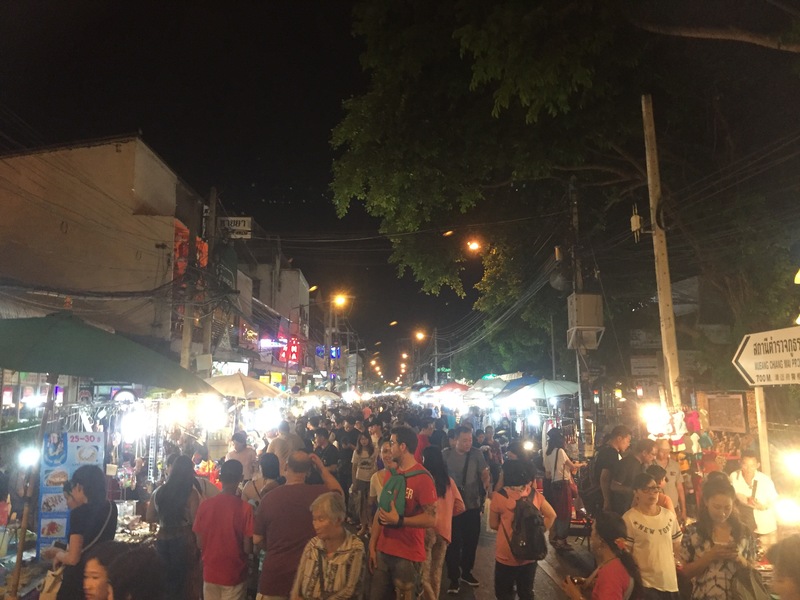 That evening we walked to the Night Bazaar for food. We didn’t do any shopping in the market because we wanted to cozy up in our beds but we were so happy to see how much cheaper everything is up north. 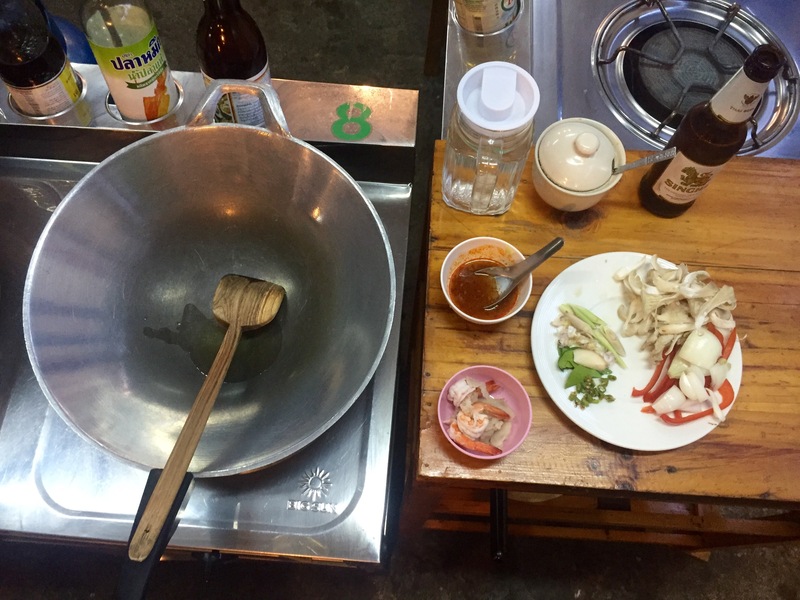 We both enjoyed a delicious pad Thai for only 40 baht which equals a mere £1! On our second day we had a very religious day. 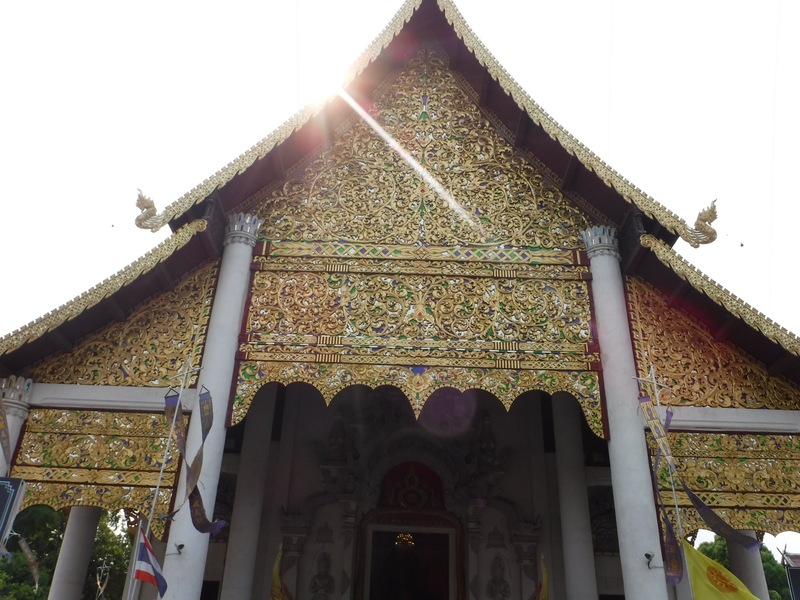 In the morning we visited Wat Suan Dok which is attached to the university of Chiang Mai. It’s worth looking the university up on google maps because its size is so impressive! We walked around, enjoying the sights and then once we entered the main temple, something was clearly about to happen because all the young monks started putting their robes on. (They wear a top, bottoms and then a big scarf/robe thing that covers most of them). We sat down at the back, very quiet and waited to see what was about to happen. We were there for nearly 20 minutes while they all composed themselves and a slightly older monk put hem in neat lines while another set up a projector screen. 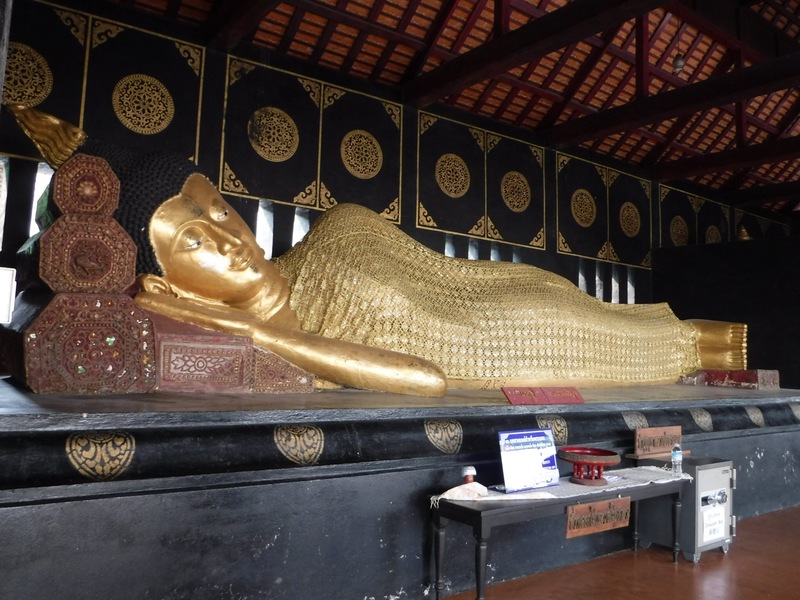 After this long built up we were thrilled to see… the monks all take a nap. Bit of an anticlimax. We decided to leave and on our way out, I donated 20 baht (50p) to their education which is nothing to me but a lot to them. Following a recommendation we had seen online, we ate lunch at Pun Pun which is next to the temple. 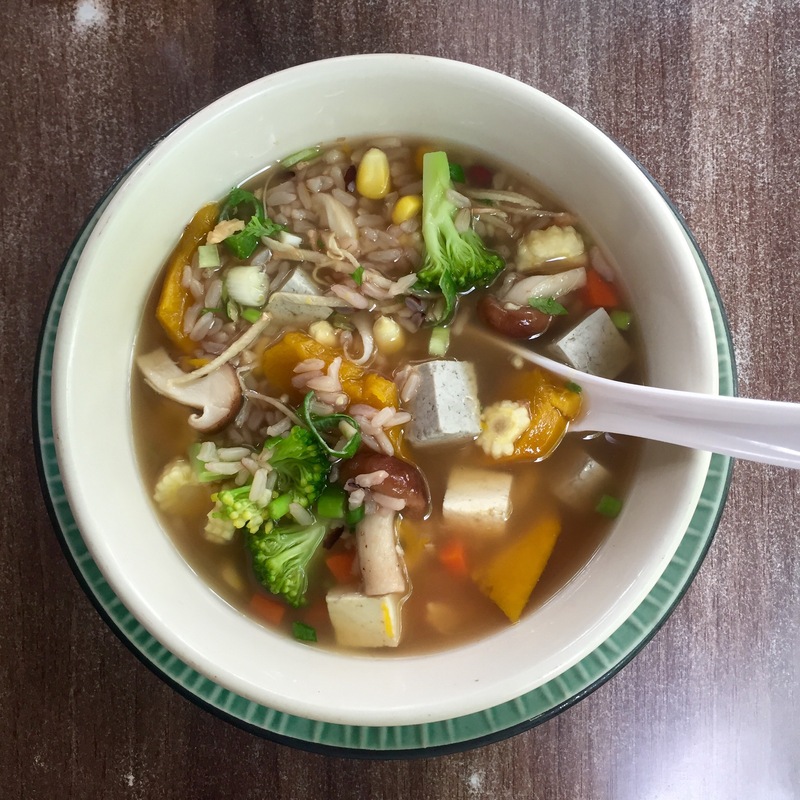 It is a vegetarian/vegan restaurant (like a lot of northern Thailand) and I enjoyed a really healthy brown rice soup with lots of veggies. 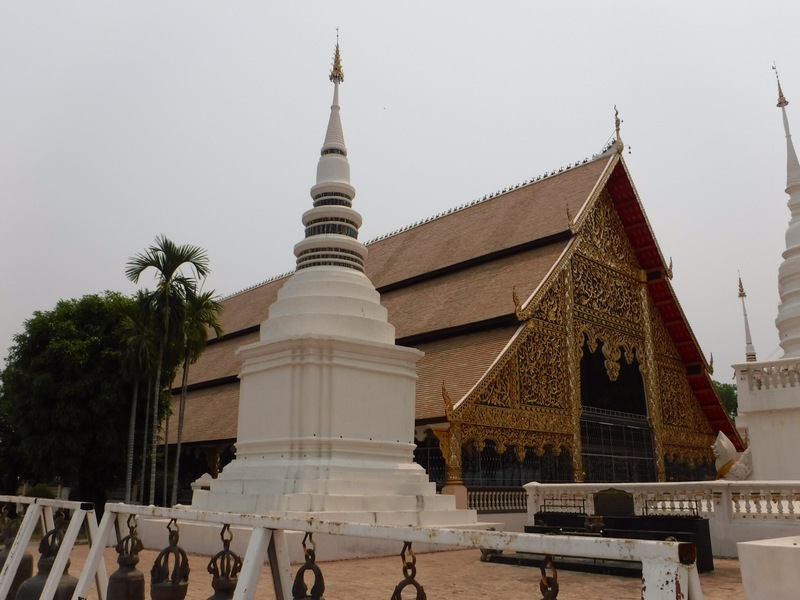 In the afternoon we went to Wat Chedi Luang. 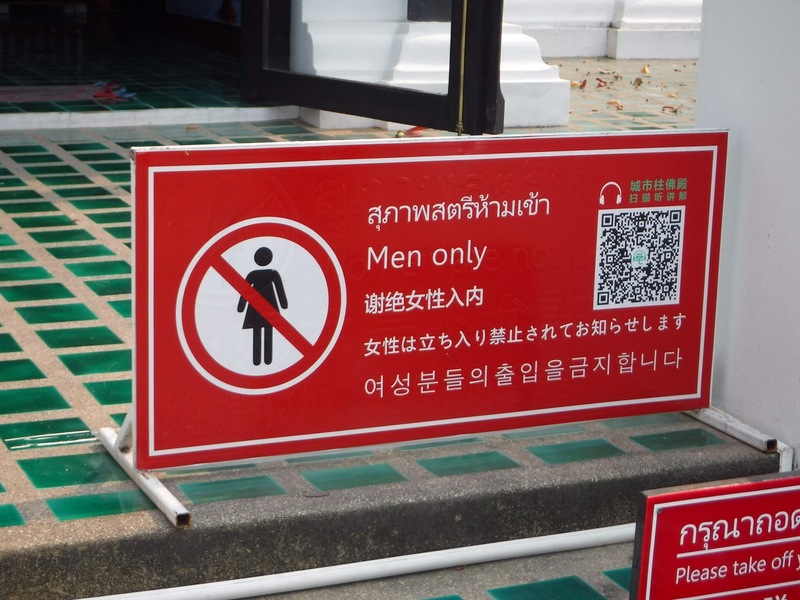 We walked past a lot of beautiful buildings including one that we weren’t allowed inside because we’re women (we menstruate and that makes us dirty humans) and then we were drawn into the main temple by chanting prayers. We took our shoes off and then silently sat at the back of the room. 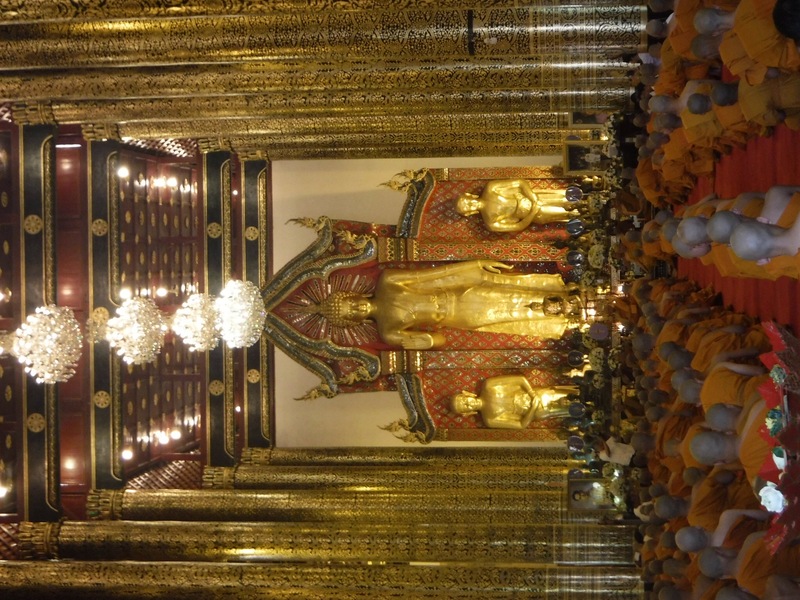 There were a few older monks at the front and then rows upon rows of younger monks on their knees in front of them. All had had all of their hair shaved off and their eyebrows too and repeated the chants that the older monk lead. I love seeing people who believe in a religion this much and I have a lot of respect for the young monks who leave their families to focus on it however, one of the very young monks did make me feel quite sad as he spent the whole ceremony sobbing and looking behind him. I couldn’t tell if he’d just said goodbye to his parents for another four months or he didn’t want to be there or what but I wished I could have gone and given him a hug. 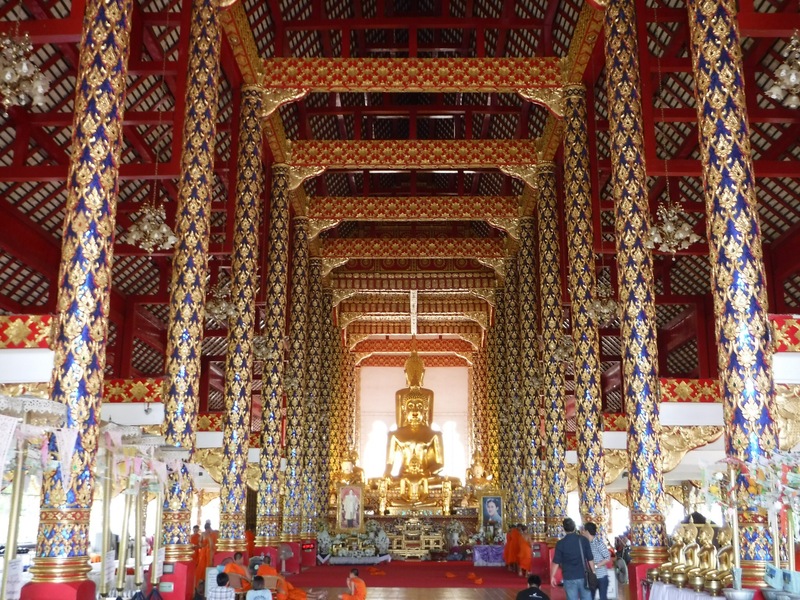 One thing that a few Wats in Chiang Mai offer that I haven’t seen anywhere else is the chance to speak to the monks. It gives the tourists a chance to learn about Thai life and Buddhism etc and it gives the monks a chance to practice their English. There was only one monk there when we went so we sat to a side and listened in on the conversation he was having with 5 other tourists. He spoke about his plans for travelling and doing his PhD, what meditation is to him and how he deals with death (which I thought was quite a weird question for a woman to ask). After some time, this woman asked such annoying questions and was just so generally annoying that we couldn’t deal with her anymore. I think the poor monk was feeling it too in his facial expressions. We grabbed an ice cream from the 7/11 opposite and headed back still with our question unanswered: do monks wear underwear under their robes? For dinner we went back to the night bazaar where we were disappointed to find that the pad Thai lady from the night before wasn’t there. Instead we went to another noodle lady nearby who served us a pretty gross noodle soup. It contained chicken on the bone (which is always an inconvenience if you ask me), some other mysterious piece of meat, a big gross vegetable and two squares of brown jelly which we later discovered was pigs blood. After a little bit of shopping where I finally bought myself a little elephant ornament, we were still hungry after our gross dinner so we went to McDonald’s and then ate our chips in bed where we were very happy girls. The next day we had a beautiful lie in in our super cosy beds and only got out of bed to get our free breakfast before 11. 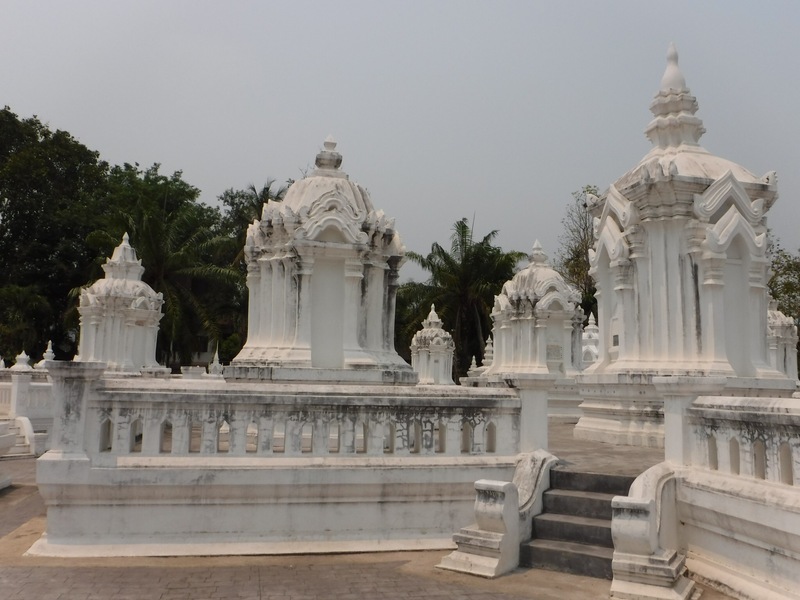 Ammun decided she wanted to go to Tiger Kingdom which is a famous attraction in Chiang Mai but I wasn’t so keen after some things I’d read online. This meant that I had a few hours to myself and I decided to make the most of the pool area in the hostel. I did a lot of planing for Myanmar and our future travels, I read some more of my book, I had a nap and I did some swimming which I’ve wanted to do for a long time. The next day was a foodie day. We had to leave our luxurious private room that we couldn’t afford anymore and check into a cheaper hostel. Check out was midday so after breakfast we refused to leave our beds until the very, very last minute. After checking into our £2 a night dorm, we ventured out for some lunch at Reform Kafè which was pretty nice and the actual cafe itself is pretty too! 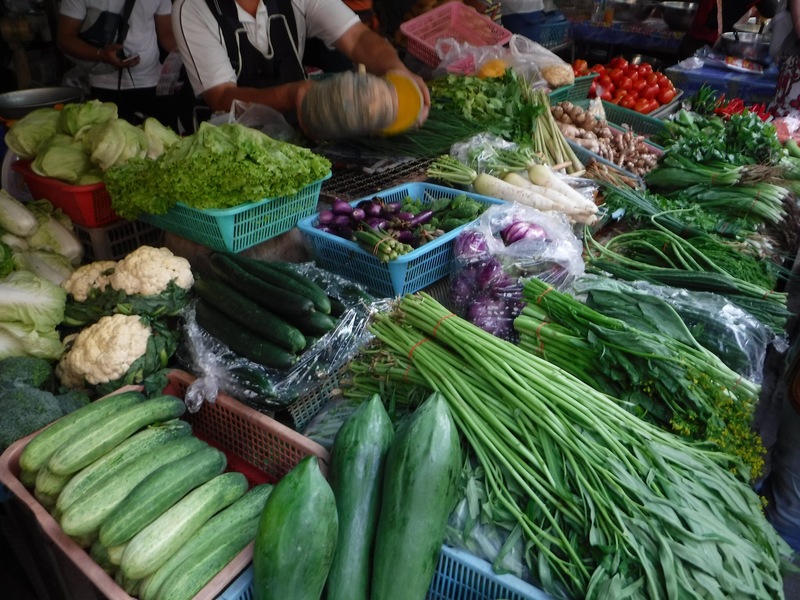 About 4pm we were picked up by two very cute, cheery guys from Zabb E Lee Cooking School in a mini van and headed to a food market. The group was divided in two and a Thai lady called Anne was our group leader. 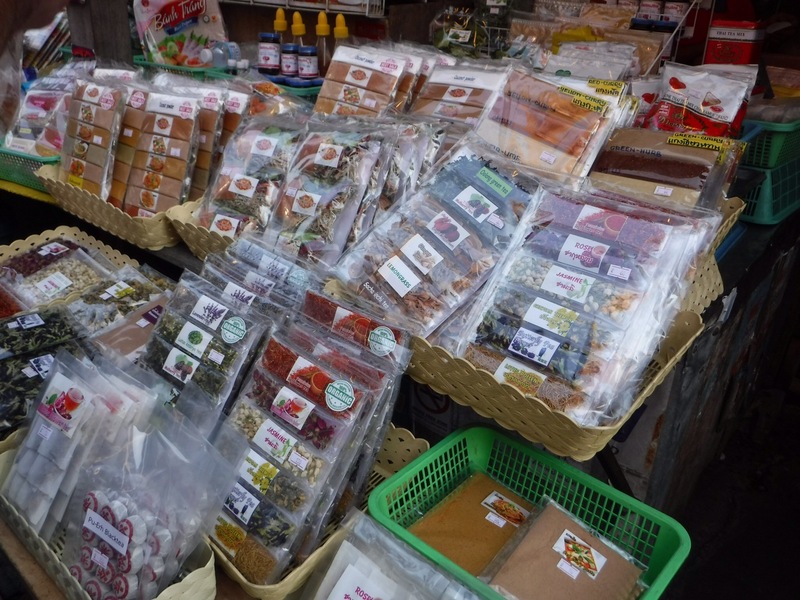 She began by telling us all about different spices and spice sets and what we may be using them for. 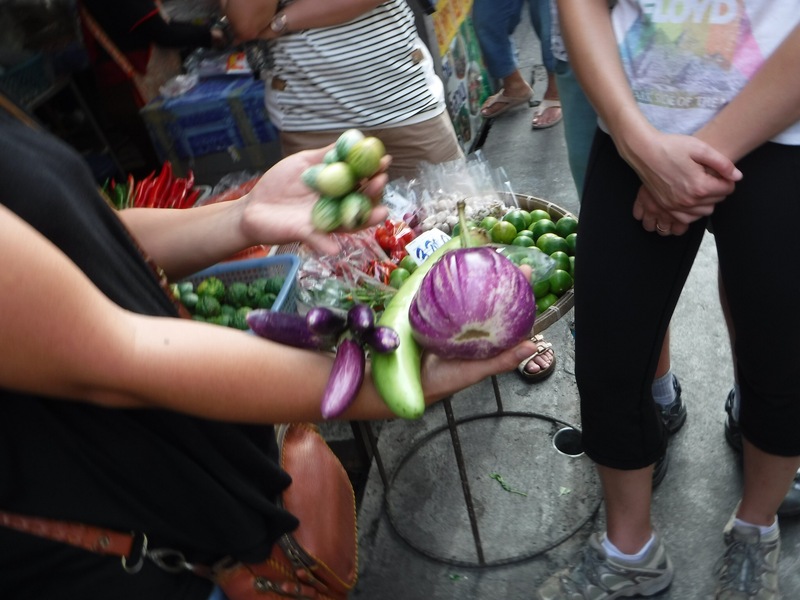 She then told us all about vegetables and herbs and the Thai equivalents and again, what we may be using them for. Already at this point we knew Anne was going to make us laugh all afternoon. After the market we went to their cookery school where there were 8 of us in the class and we all had a station each. We had all been given three choices for each type of dish and the class didn’t have to be unanimous which was good. 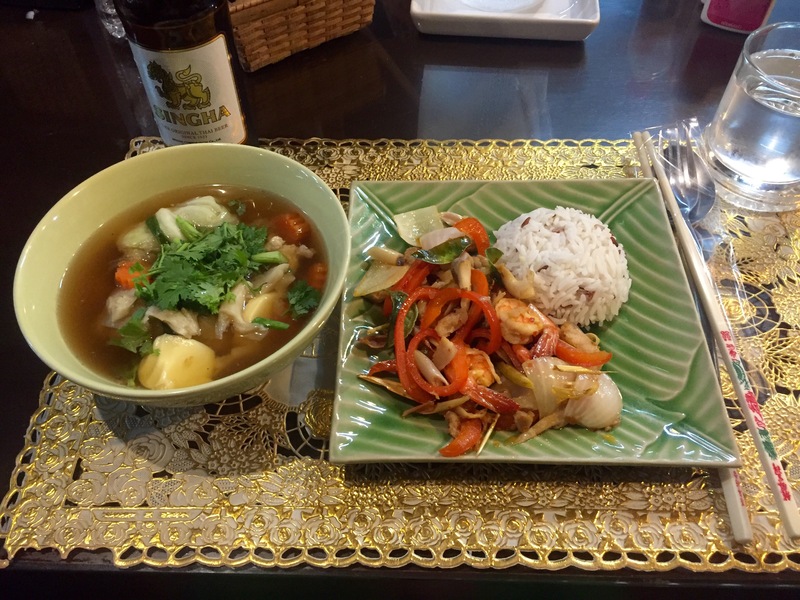 We started with the prep for our soup (I had stuffed cabbage soup) and stir fry (I chose sweet and hot seafood) and we made them both. My stir fry was just a little bit too hot because I had two mouth ulcers which was not ideal but both my dishes were so yummy! 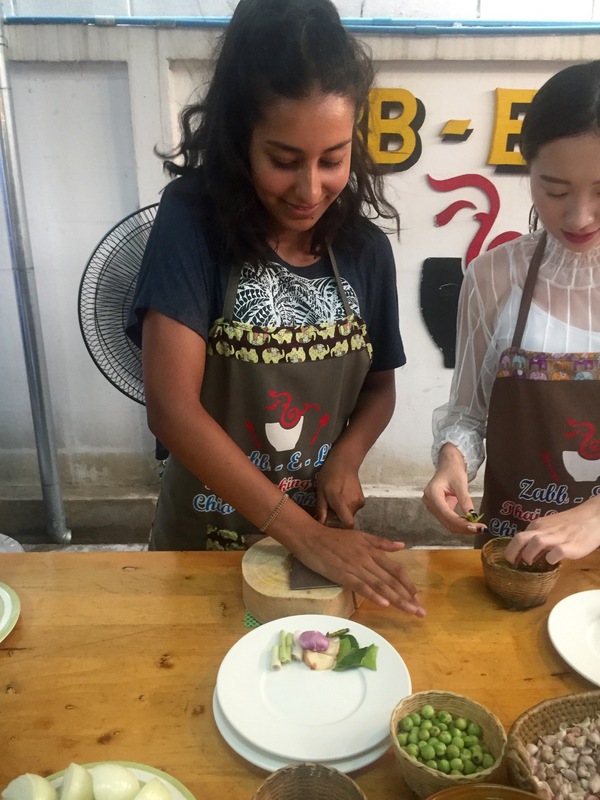 Afterwards, we were shown how to make mango sticky rice and then prepared our curry paste and everything for our curries. 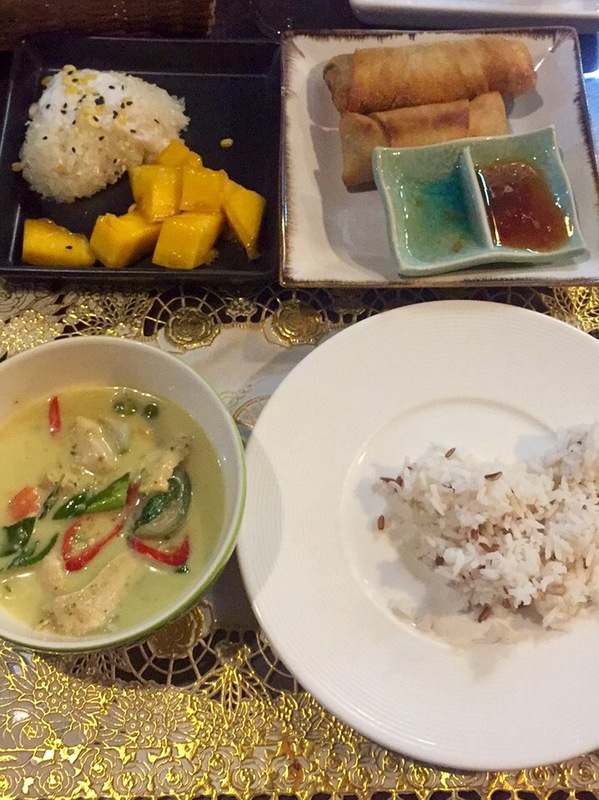 Ammun and I both went for green curry. We also both chose Spring rolls which was fun to make! My first one was done perfectly but my second one I forgot to put the paper the right way round so it went a bit bobbly and it stuffed it with extra filling so they look at bit silly with different sizes but they were both delicious and so much easier to make than I thought! After all this we ate the three dishes and they were so good. I even ate Ammun’s rice because it was too sweet for her but perfect for me. At the end of the class she gave us her recipe book that includes all the options we had plus some more! The day after was an outdoorsy day. It was also one of my favourite days of travelling so far. 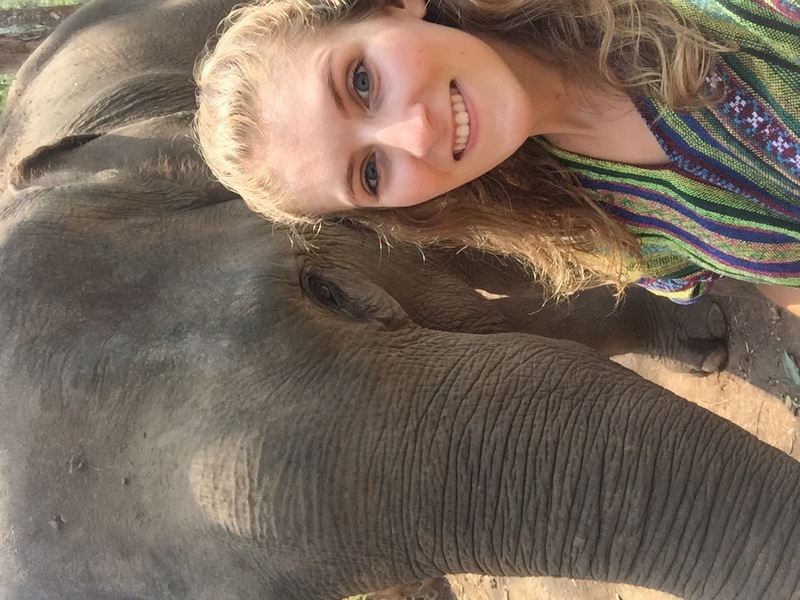 We woke up at 7:30am to go to Elephant Jungle Sanctuary! After a 2 hour drive with a couple from England, two girls from America and two girls from Argentina we arrived in the jungle and were given a talk by the Mahout leader. He explained that the elephants used to be ridden here but they have changed their ways and now don’t do it. He also told us lots of facts about elephants like how big they can get, how much they eat and how much they drink (150L per day!). Elephants sleep 4 hours a night and spend most of the other 20 eating. I don’t think I’ve ever related to an animal so much. 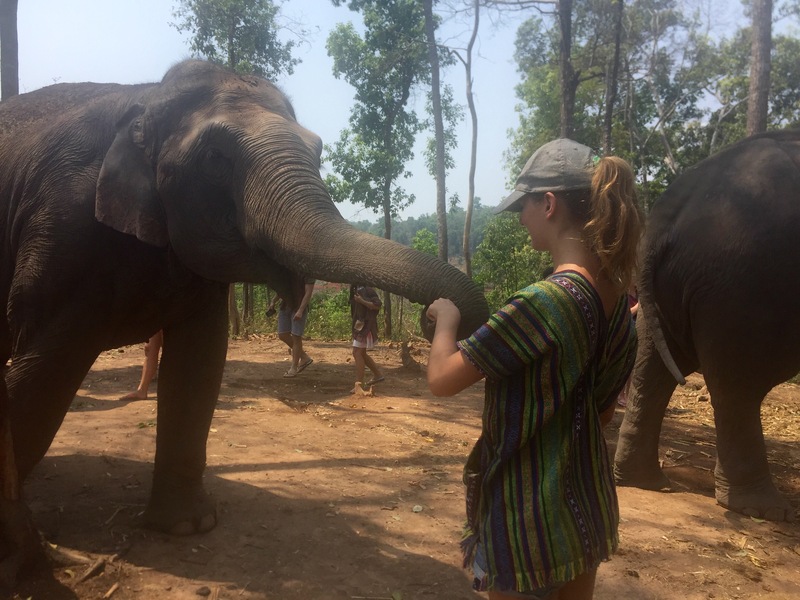 Our first activity was feeding the elephants. 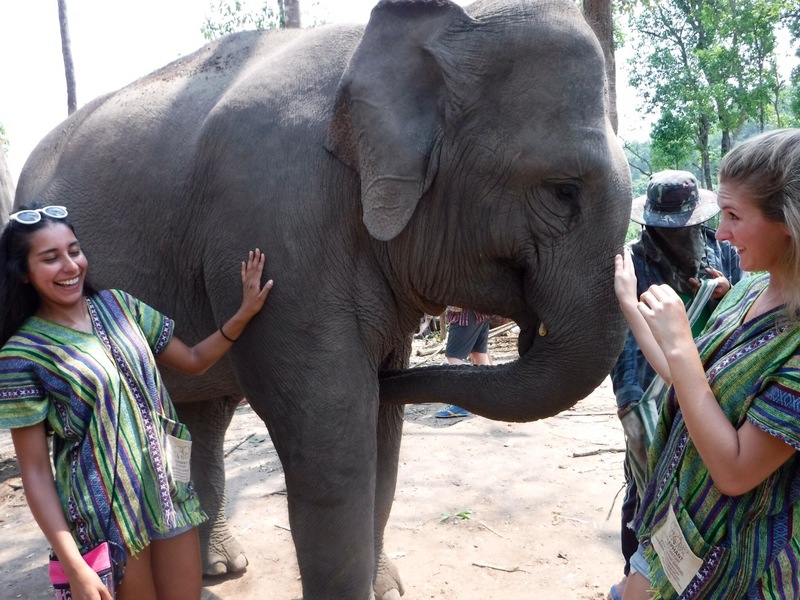 We all wore the tops that the Mahout wear as they associate them with food and they are very friendly and get very close. 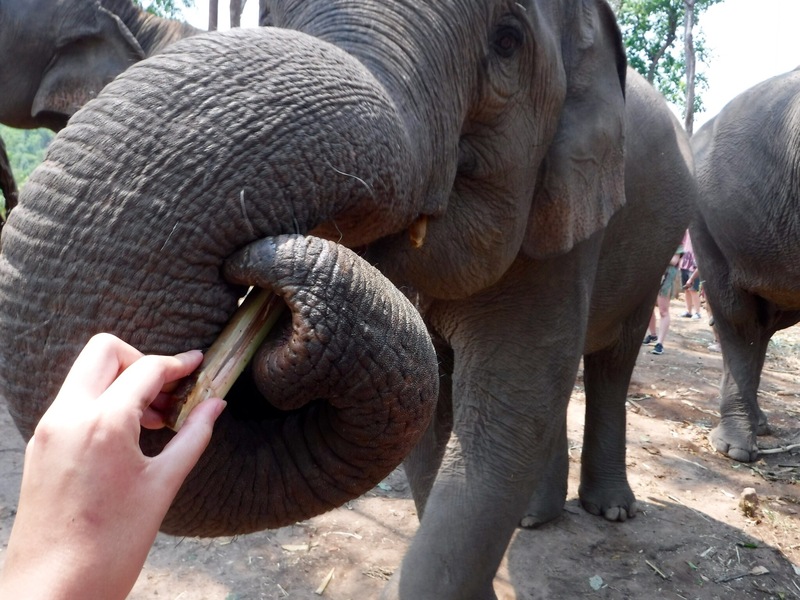 We fed them lots of bamboo shoots and we were able to touch them, get close to them and take photos with them. It’s scary that an animal so big has such little spatula awareness. They almost come a little bit too close to you so we had to be very calm and respect them and let them do what they want to do. 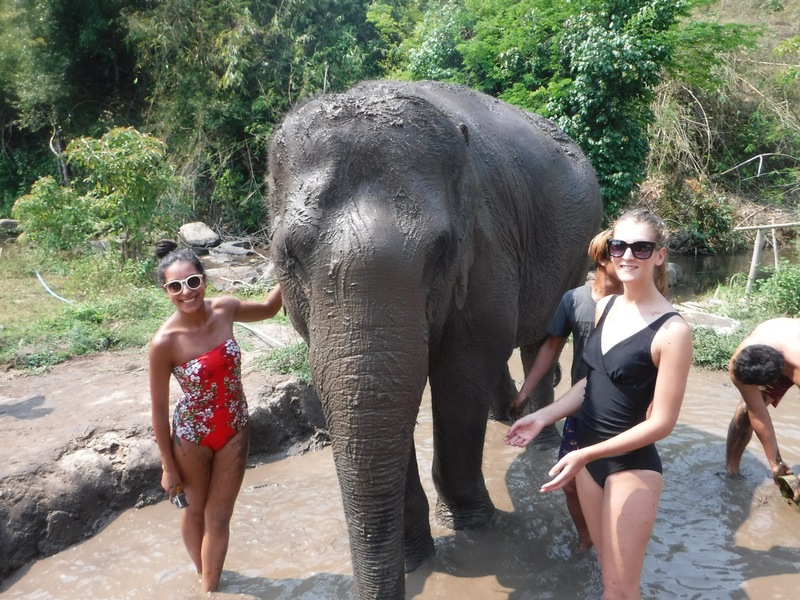 We then walked them down to the river where we could watch them roll in the water and the mud and it was so nice to see an elegant just have fun and do elephant things. 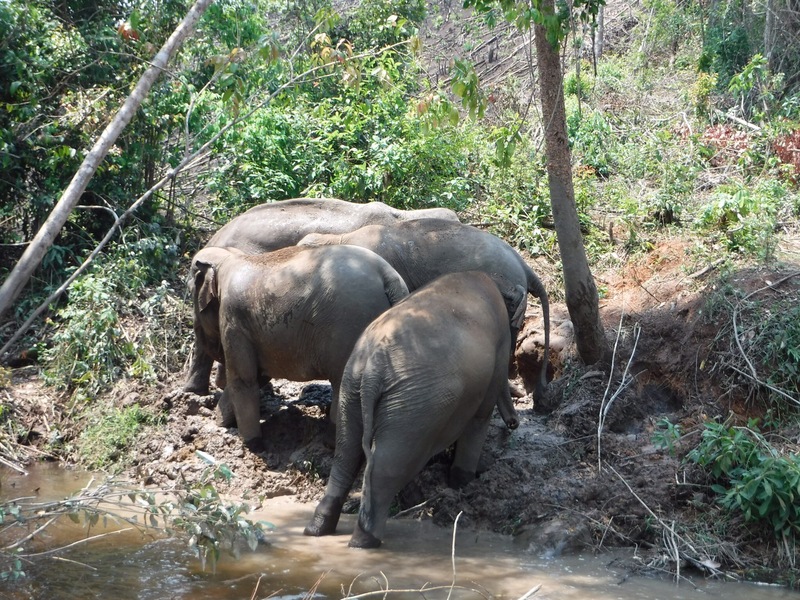 It’s clear that the 5 elephants at this location are all very close as they all have very nosey trunks! Once they had had enough, they came back onto land and came to us looking for more food. We didn’t have any. 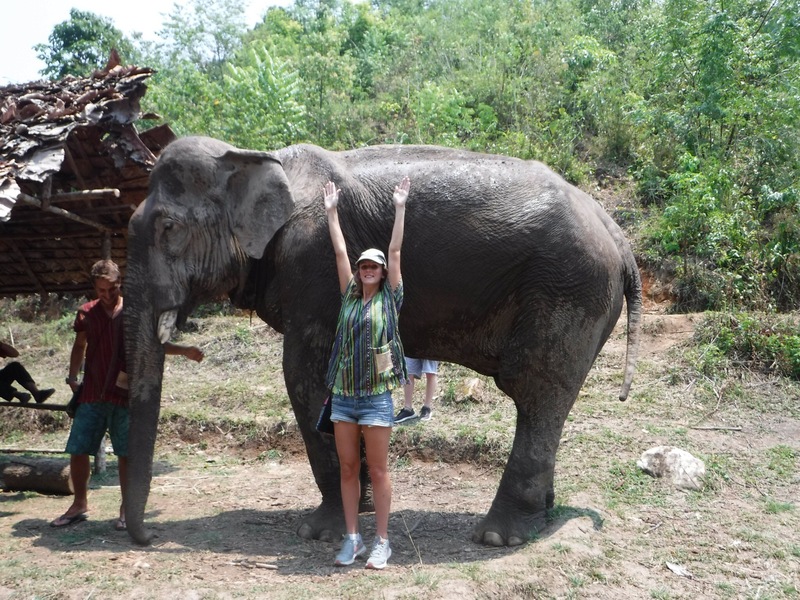 Showing how big the elephants are – I’m 5’7″! For lunch we had omelet, rice, potatoes and chicken and lots and lots of veggies – including broccoli which I miss! For pudding we had some fresh watermelon and then we were given 30 minutes to relax and do whatever we want. A day trip that allows time for a nap is an excellent day trip! I’m the afternoon we all stripped down to our swimwear and got in the water. 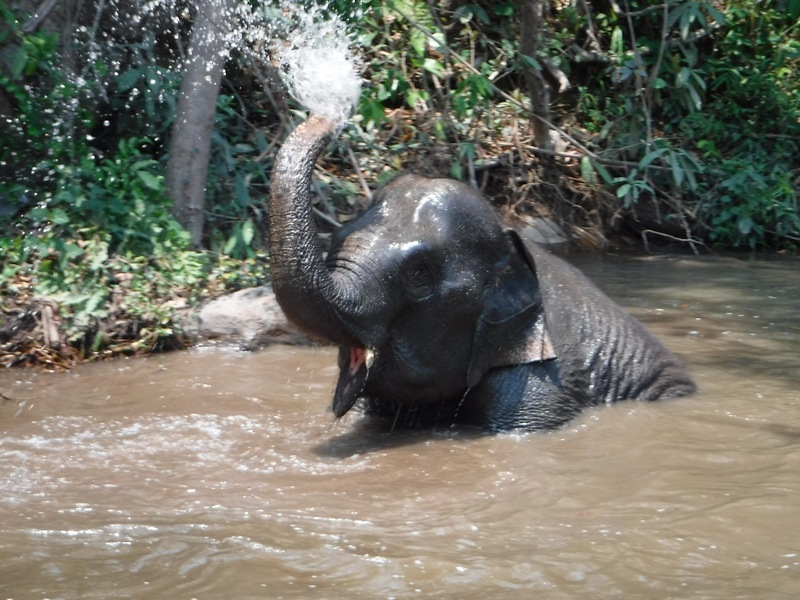 While we waited for the elephants to come to us, the guide thought it would be funny to splash us with the cold, dirty water so Ammun and I stayed clear. Sadly, one of the other guys on the tour thought it would be hilarious to throw water right at us so I had dirty water in my eyes and in my mouth. It was gross. 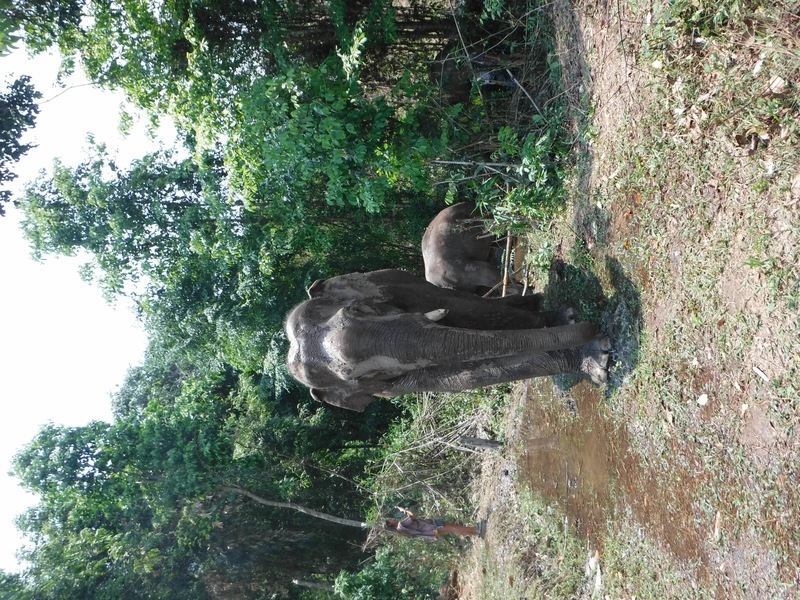 Once some of the elephants arrived we threw lots of water over them and scrubbed off some of the dried dirt. The elephants then walked into the next pool of water which was lined with thick, gloopy mud which we covered the elephants with. 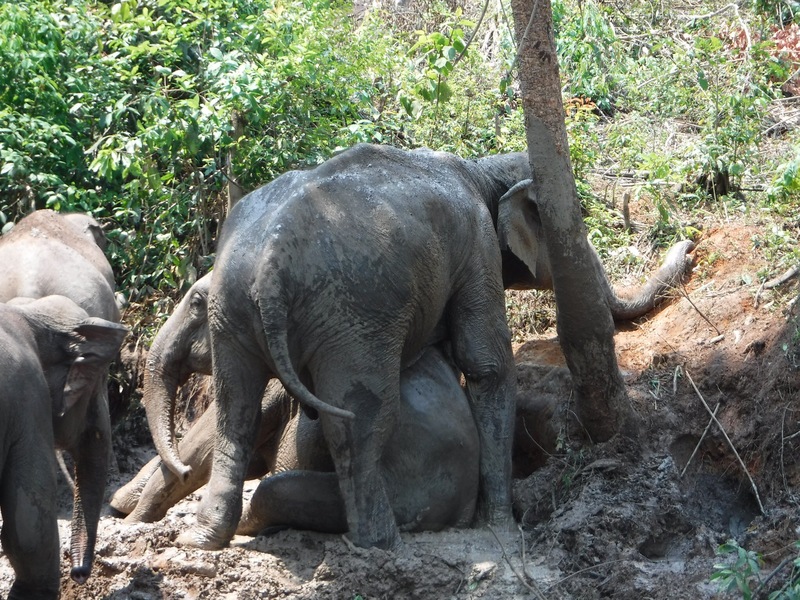 Usually the elephants will do this themselves as mud works as both sun block and insect repellent. They all seemed to really enjoy it and we enjoyed getting mud on us too! After a shower and teas and coffees we did the two hour journey back to Chiang Mai and spent the evening doing more planning. We headed out quite late for dinner and found a small restaurant that served tasty looking burgers so we got one each with a beer and made a toast to our three months of travelling anniversary! Our last morning was traumatic to say the least. Neither of us slept very well because we could feel every mosquito biting everywhere. I managed to acquire one on my little toe on my right foot which was a little bit uncomfortable to walk on. To make things worse, I had one on my big toe on my left foot and two on the toe next to that (I realised 3 days later). All were swollen and all were more painful than itchy. All was not swell. 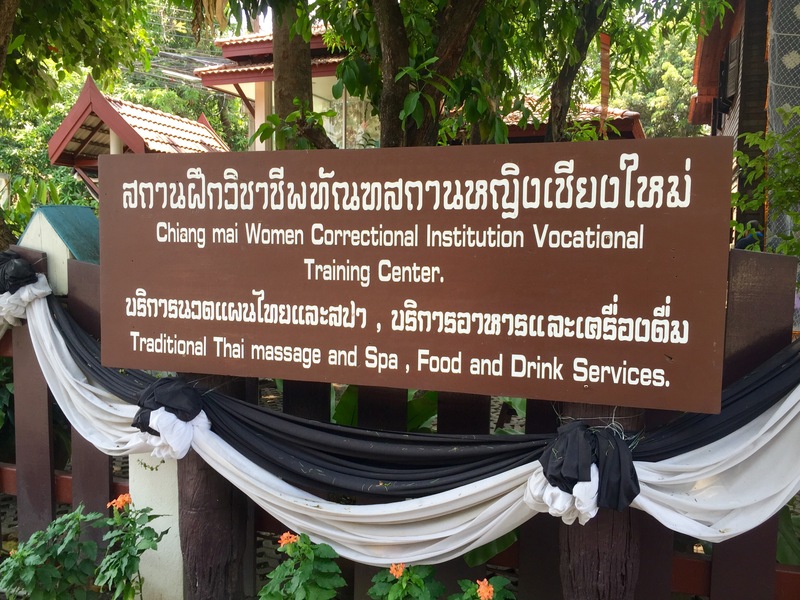 But I powered on and hobbled to a place that I had been really intrigued by since doing my research about Thailand: The Woman’s Correctional Institute. This is a prison but a prison with a difference. They believe that women who have committed minor crimes (such as drug related crimes) should go through a vocational programme so that they have a skill they can use when they are reintroduced to the real world. There is a cafe, a small gift shop and a massage centre all run by inmates and prison guards (I think). We arrived about lunchtime so enjoyed some food and then I wrote some of my blog and Ammun wrote some of her journal in their garden. Neither of us fancied a Thai massage but I was curious. I think it’s such a great idea and more prisons should offer courses like this for when inmates are released. 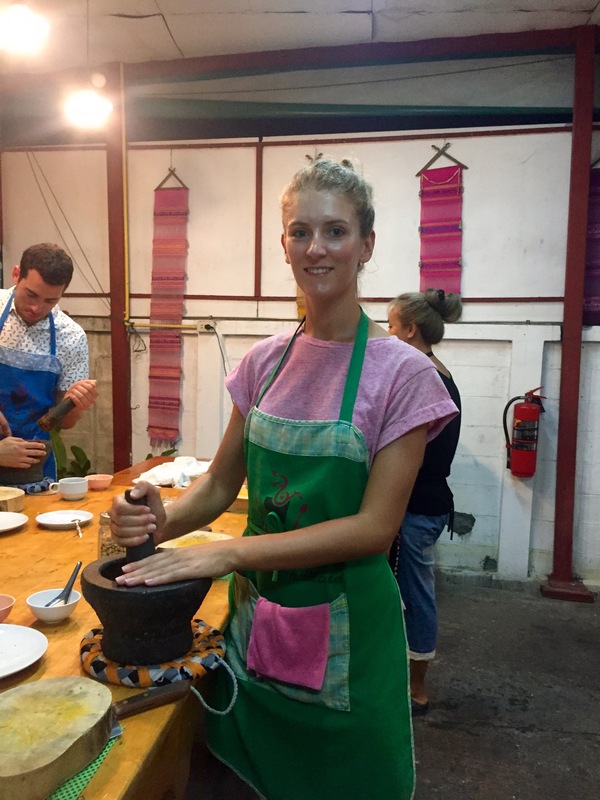 The only thing that’s better than learning a skill for them is that after 180 hours training, all their wages and tips are waiting for them once they are released! 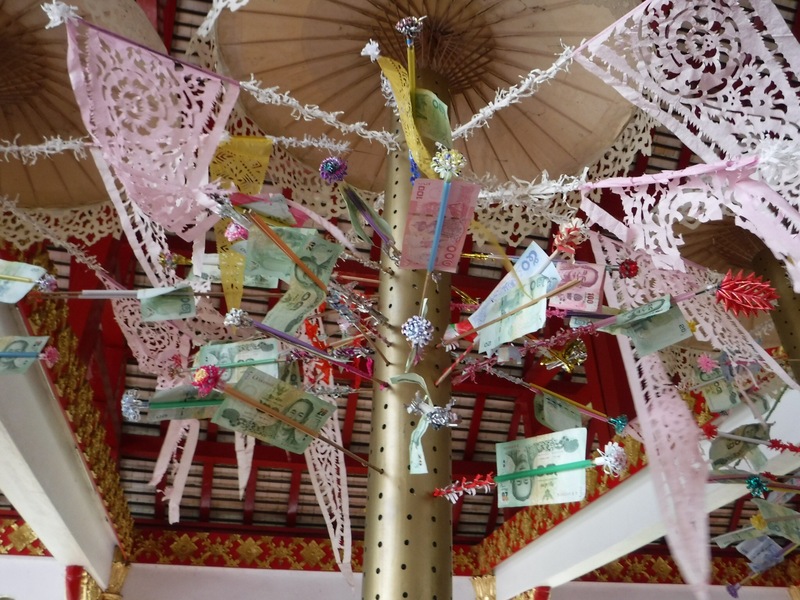 Definitely worth a visit if you are in Chiang Mai. We have now moved on to Pai which is similar to Chiang Mai in a way but a lot more peaceful and relaxed. 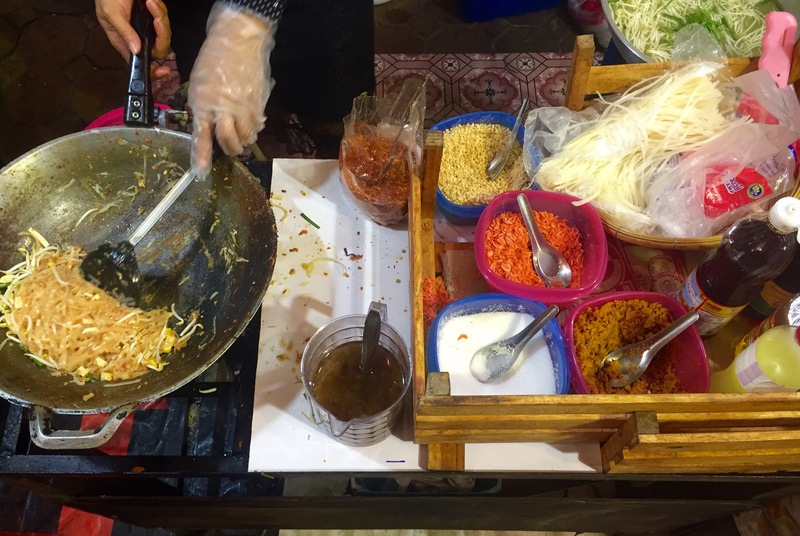 There are also a LOT of places to eat so maybe don’t read my next blog post if you’re hungry! Great stuff – looks like you had an epic time. 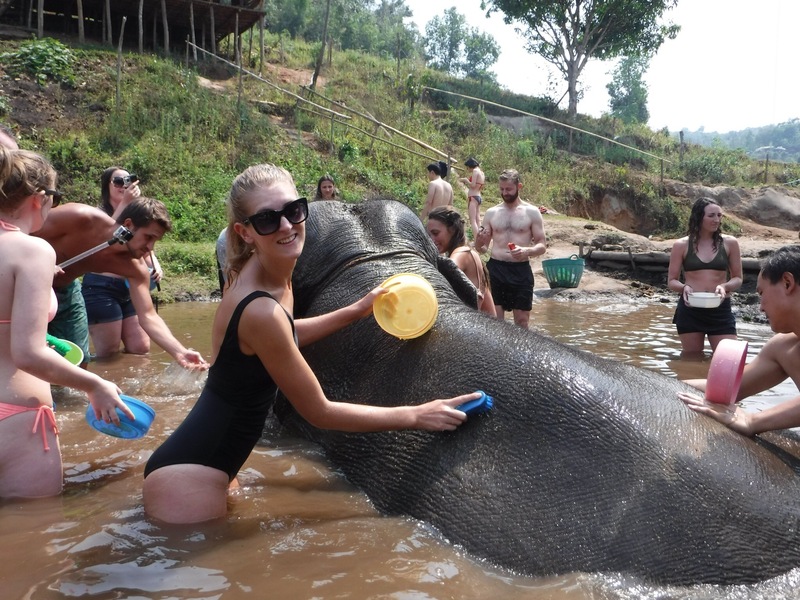 I’ve been to Thailand a fair few times now but heading to Chiang Mai for the first time in July. Interested to see what’s it’s like compared to the other parts of the country I’ve seen. It’s very different. It’s quite a spread out city so you don’t see hoards of tourists. If you have time, I’d recommend going to Pai as well for some chill time. Enjoy! 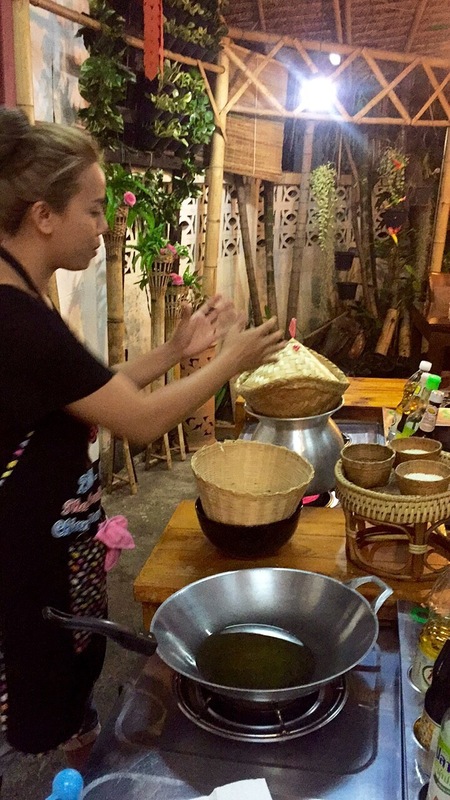 I have been wondering if people go to Thailand to learn Thai massage because it’s so popular everywhere – now I know thank you! I hope you enjoy your trip!